Acupuncture is one of the oldest, most common, and dependable medical therapies used in the world. It is by nature simple, safe and effective health care. Acupuncturists use thin, sterile, one-time-use disposable needles inserted superficially into specific areas of the body in order to help the body's ability to heal itself. Acute pain is the simpler variety. Acute pain is what results when you sprain your ankle: your nervous system sends you a signal that tells you something is wrong, and you need to stop doing what makes your ankle hurt. Acute pain is like a functioning alarm. You need to stay off your ankle in order to give it a chance to heal. We treat a lot of sprained ankles and other types of acute pain. For reasons nobody really understands, acupuncture speeds up the healing process; it reduces inflammation and swelling and also provides pain relief. Generally, for acute pain, we will recommend frequent treatments over a relatively short period of time. A sub-set of acute pain is pain that is work-related or caused by over-use. We treat thousands of people for this kind of pain: bartenders and baristas with wrist pain, construction workers with back pain, grocery workers with foot pain, teachers with headaches. If all of these people could quit their jobs, move to Hawaii, and lie on a warm beach all day, they wouldn't need acupuncture. Their bodies would repair themselves just fine. But since they can't quit their jobs and lie on a beach all day, acupuncture helps them to maintain their bodies to keep doing those physically demanding jobs. This kind of pain usually requires on-going treatment, at least for as long as the patient has the job that is causing the over-use. Chronic pain is something else altogether – in fact it is a distinct neurological condition – and it's much more complicated. Although about 30% of Americans suffer from chronic pain, it is often poorly understood, poorly treated, and stigmatized. Some pain researchers are beginning to describe chronic pain as a disease in and of itself, a phenomenon that occurs when, for some reason, the body's warning signals don't work. Chronic pain is like a broken alarm; it's permanently stuck in the “on” position. In cases of chronic pain, there is often no diagnosis that can adequately explain why people are hurting. Many chronic pain patients are terribly frustrated that they are suffering so much and yet “the doctors can't find anything wrong”. Healthcare providers who are inexperienced with treating chronic pain may accuse patients of drug seeking, malingering, or just plain making it up. The State of Oregon has a program that requires all licensed healthcare professionals to get some training in pain management. This program originated when a state legislator who had chronic pain moved to an area where no healthcare providers were willing to prescribe the medications that had been effective in controlling her pain. Awareness of the need for pain management is slowly improving, but still has a long way to go. In our opinion, it is very helpful for patients who are dealing with chronic pain to see a pain specialist (usually either a nurse practitioner or an MD), if at all possible, at least once, in order to have a thorough evaluation. A good chronic pain evaluation will give a patient a lot of helpful information. WCA receives referrals from local pain management clinics and pain specialists. This is because the latest best practices in pain management suggest trying many different approaches to manage pain – including acupuncture. Chronic pain can be very difficult to treat; there is very rarely a silver bullet or a single solution. Most patients who manage their pain successfully approach the process as if it were a jigsaw puzzle, with different pieces contributing to the larger whole – and the larger whole is the patient's quality of life – but no one piece provides “the answer”. At this time, there is no one answer for the problem of chronic pain. Acupuncture may be a piece of the puzzle; so might medication, exercise, diet, physical therapy, massage, meditation, yoga, and counseling. Every patient's puzzle is unique, and successful pain management is often the result of painstaking trial and error. The goal of pain management is not to eradicate the pain – that is not realistic for most chronic pain patients – but to support the highest possible quality of life. One of the advantages of acupuncture for pain management is that acupuncturists don't need to diagnose the cause of the pain in order to start treating it; what we mostly need to know is where, and how intense, the pain is. Also, while acupuncture is often effective at reducing pain, sometimes even when it isn't, it still improves a person's quality of life. Acupuncture generally reduces stress, benefits sleep, lifts and stabilizes moods, and improves energy. All of these effects might be helpful to someone who is pursuing a multi-pronged approach to managing chronic pain. 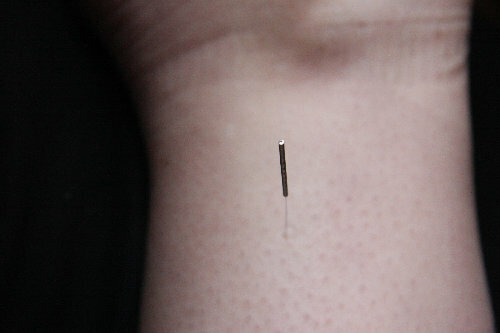 Therefore, we encourage everyone who wants to try acupuncture for pain to do so. The pain specialists who refer to us generally recommend that patients get 12 treatments as close together as possible in order to initially decide if acupuncture would be helpful for them. After the initial 12 visits, it's a good idea for the patient and the acupuncturist to have a conversation about what a maintenance schedule might look like. By that time, most patients have a good idea of what acupuncture can do for them and how much they want. We understand that many chronic pain patients are facing extremely difficult financial circumstances. Chronic pain can make employment difficult or impossible. At the same time, one of the worst effects of chronic pain is isolation – which in turn can increase the pain itself. Community acupuncture is a good option, for a variety of reasons, for patients with chronic pain. We are strongly committed to making acupuncture accessible to anyone who really wants to use it for pain management, so please contact us if the cost of acupuncture has been a barrier for you.